For those people which are considering switching for something else, by what kind of product will you replace your morning queal ? Good questions and I will address these further in the final update to the recipe (which will start shipping around end May). Please do know that the oils are always stored in dark place without air (to prevent auto- and photo-oxidation). Also when mixed the bags protect against UV. And if much oxidation should occur it should give an off-flavour which we've not found in our samples. Thank you for your perspective. I totally understand where you're coming from. As a company we could do better to understand what other meals people are eating and see if we could better match that. I will add a question related to this to the dashboard to get a better sampling. Two groups that I think we will serve well with the new formula are 1) people who use Queal 70-100%, and 2) people who use the time/effort to make a 'good/balanced' meal for the 1 to 2 other meals. Just to use myself as an example. On average I drink 2 shakes of Queal and eat a bar most of the days. I use the time I win during the day to cook a balanced meal in the evening. I'm vegetarian and am active with sports so I know that I need enough protein. But with mushrooms/meat-replacements/etc I do find that I can easily fulfil that. One thing we could also do better is to make example days / meal-plans that highlight different scenarios and give a better insight into what Queal would mean for your day (in combination with a variety of different meals). Would that be interesting or would everyone's diet vary too much to provide insight that way? Thank you for providing this different view. Please know that the EFSA recommendations are our primary source and websites like Examine.com only help inform our changes/recommendations. EFSA actually incorporates many studies and I highly recommend reading their papers on both macro and micronutrients (although to can get dense). The changes for Athletic 5.0 will still take a long time and for now the price and formula will not be changed. When we do we will definitively explain why. Without shooting ourselves in the foot too much. As mentioned before it's also possible to add a bit of whey (or casseine) protein if you wish yourself, but I understand that this defeats the convenience of the shakes. And know that Athletic 4.0 will still be available the next few months. I'm a 70%+ user (sometimes 100%). I welcome the protein reduction as i'm not using Queal as a sports shake, and my extra meals are usually very high in protein themselves. I'll give more feedback later on digestion, taste and consistency as i have only tried the new recipe once at the moment. was wondering the same as you kelt. any information about it would be deeply appreciated! thanks a lot! It follows the same considerations as for Standard and you can read more about the changes in the original blog. I totally understand. Sugar has a very bad reputation. But not all sugars (or in a broader sense, carbohydrates) are created equally. What has changed is where a lot of these carbohydrates come from. Where first just over half came from Maltodextrin, it has now been lowered to 25%. The other 25% is from Isomaltulose. Isomaltulose is a disaccharide carbohydrate composed of glucose and fructose. It is classified as a sugar (instead of polyols) because of the short-chain structure. It has a much lower impact on blood sugar levels than Maltodextrin, and doesn't stimulate the release of insulin. It is also found not to add to tooth decay. Therefore, the glycemic index of Queal drops from a moderate 65-70 to an even lower 50. This puts Queal 5.0 in the same range as Whole Wheat Bread, Corn Tortillas, and Spaghetti. I'm new to Queal and I'm on my first batch after the taste tester pack, but I have to say the Royal Rice Pudding is probably the best flavor I've had. Wish it weren't limited edition, so I'll be ordering more bags when I can. Royal Rice Pudding was the best flavor ever and I've worked thru all the standards. It's even better than my previous favorite Awesome Apple Pie. I also had no trouble with digestion/gas afterwards (which I had with almost all of them, except with Macchiatto and AAP to an only minor, but still annoying degree), which might be due to the lowered protein content. 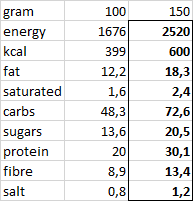 Getting enough calories in the first place to build muscle is a more important issue for me, than hitting some mystical macro-ratio target (I have virtually no sensation of feeling hungry ever, which is a downside of being 'metabolically flexible', I guess). I was disappointed, that I couldn't vote for RRP to become part of the permanent line-up. I don't have an opinion about the reduction in Palm Fat (was that for Hippie reasons or health reasons?). I don't know what GI is. so please go ahead with this. I'm never not satiated, really. Energy levels don't change dramatically after a meal for me anyway, unless I go full pasta, after which I get tired and sluggish. I think it might dissolve better in water, but I'm not entirely sure. Just to be absolutely clear: The currently running poll is to vote for which Limited Editions will get a repeat appearance in May, not to become a permanent part of the line-up. You can't vote on it, as it's still available right now. Oh okay. I misunderstood. Still want RRP to be permanent, though. Finally got the Royal Rice Pudding. On the first try, pretty tasty. Good job! As a side note, delivery times (10 days) and costs to Bulgaria are pretty bad (not sure if you can do anything about it). Pardon me if I’m particularly slow, but doesn’t this translate as “We will increase the price of Queal Athletic when we release Queal Athletic 5.0 but will tell the reason for the price hike at the time of release and not before.”?